Yesterday I shared with you my thoughts about Kirstie Clements book The Vogue Factor. Today’s book is called Tongue in Chic. 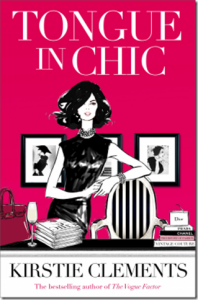 Following in the stiletto heels of her bestselling The Vogue Factor, Kirstie Clements’ Tongue in Chic is a witty and salacious exposé of the world of glossy fashion magazines—a tell-all by the ultimate insider. True events revolve around the fictitious Chic magazine—where an average day involves counting calories (preferably other people’s), masterful justification of spending half an annual salary on a blue fox fur, and keeping a kohl-lined eye on the competition. Clements worked for Australian Vogue for years. The characters and scenarios are taken from all this experience but she has mixed it all up and added fictitious elements. Yet she still refers to herself using her own name. So it’s fiction? But with Clements naming herself in the book as herself. No it is not fiction, it is her real life experience with character name changes. The importance of a great collection was that it challenged your thinking, that it combined historical and contemporary references and stirred the imagination. At Chic we made an effort to feature rational, wearable fashion in every issue, despite the fact that many of the younger fashionistas in the industry – being more enamoured with neoprene corsets than we were – would then accuse us of being conservative or boring. There was no pecking order in our office when it came to talent. If you produced a wonderful shoot, article or layout, or had an innovative idea, your work was acknowledged. Clements has made this an enjoyable read. She describes various aspects of her job including her colleagues in an engaging way. Appropriateness is another element that informs the truly stylish. My only criticism is that it came to a rather abrupt end. Kirstie Clements began working at Vogue Australia in 1985, rising to editor-in-chief in 1999, a position she held until 2012. She co-authored In Vogue: 50 Years of Australian Style, and her bestselling memoir The Vogue Factor was released in March 2013. She has been a columnist with The Sunday Telegraph and a judge on Australia’s Next Top Model.